Environmentalists say the Phillips 66 marine terminal plan also could lead to the refining of dirty tar sands oil in the region. Andres Soto of CBE also worries about increased diesel pollution. When Vallejo homeowner B. Todi heard that the Phillips 66 oil refinery wanted to start bringing in more oil by ship — more than double the current amount — her mind immediately went back to a warm night last September. "All my windows were open," she recalled. "I woke up in the middle of the night very sick — nausea, headache, sore throat." Todi didn't sleep that night and was too sick to go to work the following day. More than 1,000 Vallejo and Benicia residents called in complaints about the odor, and more than 100 went to emergency rooms. They later discovered that the toxic air was blowing over the bay from an oil spill at the Phillips 66 Marine Terminal in Rodeo in Contra Costa County. So at recent community meetings about the proposed expansion of that marine terminal, Vallejo and Benicia residents, along with East Bay environmental activists, had a lot to say — about oil spills, increased diesel pollution from ships, the possibility of an influx of dirty tar sands oil from Canada, the lack of air quality monitoring, and inadequate emergency response. "More than doubling the tanker traffic could significantly increase the risk of oil spills in the bay," said Erica Maharg of Baykeeper, in an interview. "It could be one catastrophic spill. But also it could be the oil spills that happen in daily operation, like the one last September. These things just happen at a marine terminal." Authorities still don't know exactly what caused last September's spill. The U.S. Coast Guard report, issued months later, said investigators couldn't tell whether the spill came from the ship or the terminal. The spill also raised concerns about emergency services. "Vallejo is downwind from the refineries. We get their dirty air but we are not included in emergency plans because we're not in the same county," said Vallejo resident Ken Szutu. More ships entering the bay and idling at the dock would also mean a big increase in diesel pollution, said Benicia resident Andres Soto, who works for Communities for a Better Environment (CBE). In its permit application, Phillips 66 acknowledged that more ship traffic would increase air pollution and might require "mitigation in the form of offsets." Pollution offsets allow a company to pay for clean-air projects elsewhere to make up for increased pollution from its facility. Solano County Supervisor Monica Brown, who hosted the meeting in Benicia, said she has asthma. "They can put in solar panels somewhere, but that doesn't help me breathe." Several residents at that meeting also said they were upset about the lack of monitoring and public information about air pollution. Vallejo resident Liat Meitzenheimer said that when the toxic air settled on her city last September, residents "went for hours without knowing what it was." Jaime Williams of the Bay Area Air Quality District responded, "We're looking at additional monitoring. We did pass a new fee schedule to have the largest sources of pollution in the Bay Area pay for more monitoring." 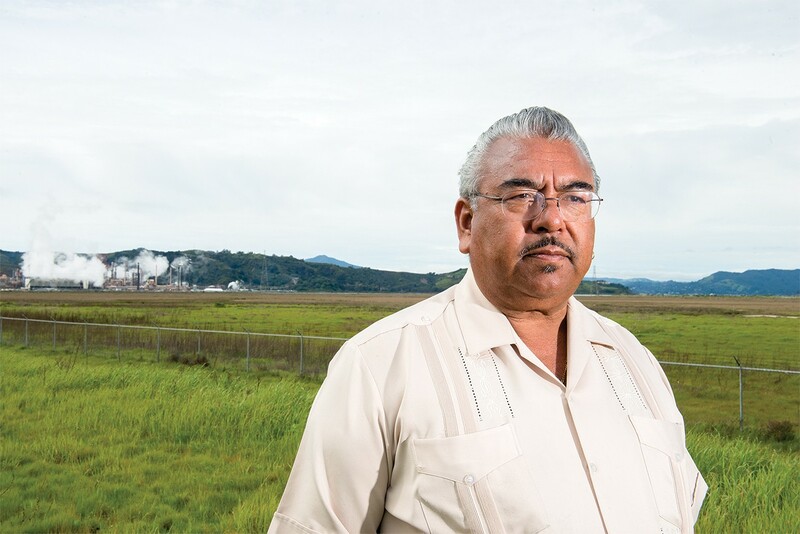 Concerns about air pollution are also fueling a years-long campaign by Vallejo residents to prevent the construction of a cement plant and deep-water port on Vallejo's south shore. Vallejo's 94590 ZIP code already has one of the highest asthma rates in the state, noted Meitzenheimer (a 2013 Kaiser report backs up her assertion). Fellow Vallejo resident Don Osborne pointed out that many of the city's residents are low-income people of color. "This is an environmental justice issue," he said. Williams said the air district is working on "a new set of risk-reduction plans" that will include environmental justice considerations. The elephant in the room, according to environmentalists, is what they see as the likelihood that the project would mean a major increase in oil coming to the Bay Area from Canadian tar sands. Oil-industry watchers like Greg Karras, senior scientist at CBE, don't believe Phillips 66's assurances that the project will not change the composition of the crude oil processed in its refinery. Tar sands crude is "the cheapest oil available at the closest distance by water," noted Karras. "And the Phillips 66 CEO has told investors they're targeting Canadian heavy crude." Refining and burning tar sands oil releases more toxic pollution and more greenhouse gases than conventional crude. In addition, spills of tar sands oil are especially destructive. Because tar sands crude is so heavy, said Karras, "spilled tar sands oil sinks into the water — you can't skim it off like a regular oil spill, so it ends up staying in the environment." Over time, the thick oil gradually vaporizes, so it becomes a continual source of water and air pollution. Paul Adler, a spokesperson for Phillips 66, declined to be interviewed for this story. Karras also doesn't believe Phillips 66's claim that the project won't increase the amount of oil refined in its plant. Refinery officials say oil from tankers will replace oil now coming by pipeline. But Karras pointed out that most of the oil coming by pipeline is from the Phillips 66 refinery in San Luis Obispo and is an integral part of the Rodeo plant's operation. The Rodeo plant now processes, on average, fewer than 130,000 barrels a day — the amount it proposes to bring in by ship. Adding that to oil coming in from San Luis Obispo, Karras said, shows that "this is a refinery expansion project. Saying that it isn't doesn't pass the laugh test." The air district will take public comments on the proposed project until Aug. 28. Paul Adler, a spokesperson for Phillips 66, declined to be interviewed for this story because, he said, public comment is still going on and the company wants to "respect the process."